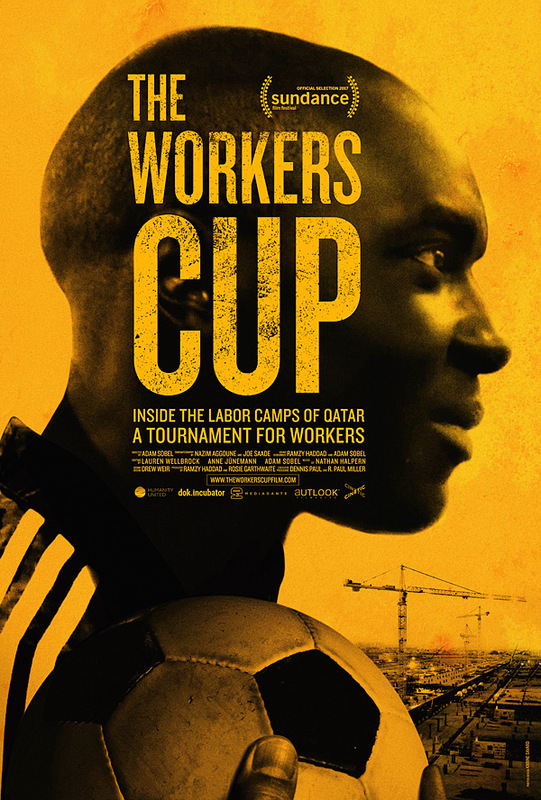 The Workers Cup (Director: Adam Sobel): When Qatar was awarded the 2022 World Cup, there were audible gasps in the room. A gulf state with no discernible football culture or history, it seemed to win simply by virtue of its considerable oil wealth. Since there was no existing infrastructure for an event of this magnitude, soon dozens of companies were on the ground, planning and bidding on the myriad of construction projects that would prepare Qatar for its moment in the global sporting spotlight. Director Adam Sobel has lived in Qatar for many years, working as a journalist. He was interested in telling the stories of the migrant workers who come from all over the world in search of a better life for themselves and for their families back home. But he found that in his reports for mainstream media, there was only time and attention for a very simple narrative, that of the workers as hapless victims of an exploitative labour system. He wanted to dig deeper. When the organizing committee of the World Cup announced they’d be organizing a football tournament for workers in 2014, Sobel saw his chance. 24 company teams were chosen to compete and Sobel embedded himself with the team from Gulf Contracting Company (GCC). We see how the workers are housed in camps far from the city of Doha and their work sites. They are bussed to and from work, but have no opportunities to leave the camp otherwise. Their food and lodging is provided, but the environment very much feels like a prison to them. Workers from different parts of the world (Kenya, Ghana, Nepal, India) are segregated from each other and most feel quite lonely. The tournament is a rare chance for them to mix with other nationalities and even to socialize with workers and managers from very different levels of the corporate hierarchy. Watching the players carve out moments of joy away from their jobs is truly bittersweet. Captain Kenneth was lured to Qatar by assurances from his agent that working construction would lead to a chance to play football for a professional team. Realizing those promises were nothing but lies, Kenneth put his head down and resigned himself to long days of hard work. But being chosen captain of the GCC squad reawakens his love for the game, and reveals an inspiring and shrewd leader. After the team’s first win, he corners the chairman of the corporation and practically demands more training time for the squad. Nepalese Padam celebrates every goal with his newfound African friends, but also discovers that the line between teasing and racism can be razor thin. Kenyan Paul talks about women constantly, and yearns to leave the camp to go on a date. Though both players and managers know that the tournament is a PR exercise and a way for their companies to attract positive press and recruit more workers, they can’t help but get caught up in the spirit of teamwork and competition, and the film does a good job of immersing the audience in that atmosphere as well. We follow the team’s progress through the tournament and share in the players’ joys and disappointments on and off the field. In the process, nationalities and jobs matter a little bit less. Near the end of the film, there’s an absolutely remarkable moment when Sebastian, a man with a comfortable (though still not lucrative) position in management, gives a jaw-dropping speech in the locker room to the players. It’s an example of what documentary is capable of, the ability to capture unpredictable emotions in real-time, and perhaps life-changing epiphanies, too. Though I’ve always been aware of the corruption and exploitation behind large-scale sporting events, The Workers Cup does an excellent job of humanizing the people (at all levels) caught up in this infernal machine.